This guide was written by me, Marco AKA mnmkami AKA TheMechanicritic! I have a ton of BattleCON experience under my belt. I also consult some of the known players to confirm the information presented in these guides! The Hand of Divinity does well against fighters who cannot keep-up with his amazing trading and dodging power. This means characters with limited damage, or limited time, such as Karin and Clinhyde respectively, have trouble dealing with him. Mikhail's problematic match-ups come from characters who are easily able to control the pace of the game. These control characters make sure that, when Mikhail decides to use his Seal Tokens, he wastes them on nothing. Characters like Marmelee and Sagas are great examples of this. Mikhail is a mega heavy who has absolutely overpowered styles. However, to even use them, he must pay for it with a Seal, which can only be regained by taking damage. Trade often. Mikhail is powerful, no doubt, but he can only afford to step on the gas for so long. To ensure a stable power level, he must take damage to regain Seal Tokens. As such, do try to trade with your opponent as much as possible. Scroll up! Scroll, Mikhail's unique base, is the only way to regain Seal Tokens without taking damage. As a result, the base has below average stats, which are often mitigated by his styles' amazing effects. 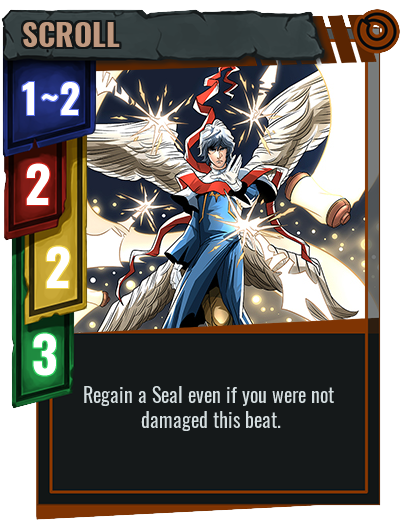 Scroll also allows Mikhail to regain Seal Tokens even if the opponent dodges, making it a good counter to one of the biggest forms of counter-play against him. You don't always need a style! Just because they're powerful, it doesn't mean that you need to always apply your style to your attack. Sometimes, it is actually better to simply save the Seal for a future beat. The most obvious example of this is when using Dodge, but there are many more. Mikhail serves a really simple role on the team in that he does not have any particularly egregious match-ups. His bad match-ups are hard to deal with, but not down-right impossible. With correct reads and play, Mikhail can perform against nearly anyone. Such is the strength of his powerful styles. As such, Mikhail fulfills more of a "fill" role on the team, providing a consistent character that can somewhat be useful in a variety of situations. Mikhail's Unique Ability is Sealed Power. He starts the game with 3 Seal Tokens and must ante one in order to apply his style to his attack. Otherwise, he's essentially playing a naked base. In order to regain them, Mikhail must either take damage or play his Scroll base. More than anything, this Unique Ability is an obvious drawback meant to mitigate just how powerful Mikhail's styles are. However, this Unique Ability has one edge use. By not applying his style to his attack, Mikhail, essentially, gains on-demand access to a Range +0, Power +0, Priority +0 style with no text. This can be useful if the styles in your hand have Priorities lower than 0 and you need to be fast, for example. Looking for such opportunities can prove to be a huge boon. 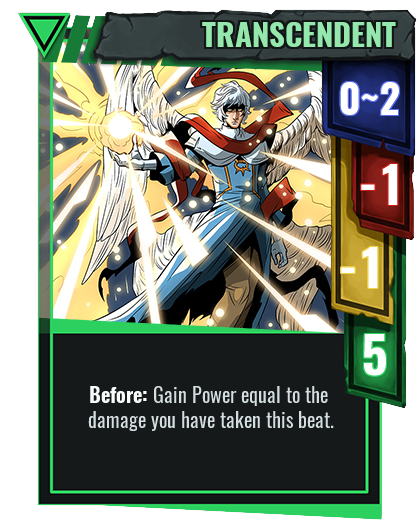 Sacred might seem like such a simple card, but there's oh so much more to it. You see, many similar cards often come with a few drawbacks. Attacks that allow a character to instantly dodge attacks at range X or greater usually have poor Priority to make you rely on the dodge more. Also, that X is usually 4. Finally, they sometimes come with a specific condition that triggers the dodge effect. With all this in mind, it's not hard to see why Sacred is powerful: it doesn't have ANY of these drawbacks! Sacred just works at a lot of ranges due to its effect and range, making Mmikhail absurdly hard to fight against at range 3 or greater. Use this style to pressure your opponents into advancing into you. That, however, may not prove to be such a great idea. Hallowed is precisely the reason why doing that might be a huge mistake. Not only will the opponent take over 6 points of damage, they'll likely just be pushed back to the edge of the board, setting-up for another Sacred beat. Hallowed is Mikhail's strongest melee option. It deals an absurd amount of damage at a respectable speed. On top of that, it has nearly magical Range, giving his attacks range +0~2 when not dealing with Bursts. However, do not be fooled, this style STILL works, even at long range, giving Mikhail a LOT of options to dish out divine punishment. Immutable is probably one of Mikhail's weaker styles. You heard that right. One of Mikhail's weakest cards is essentially Cadenza's Clockwork with less Power and more Range. This style is quite powerful as it gives Mikhail another absurd trading tool with an effective Power +5. The Soak also proves useful in the late game, when the slow-going Mikhail can have trouble against speedy executioners. What makes this style less powerful than the rest is how taxing it is on Mikhail's Seal management. 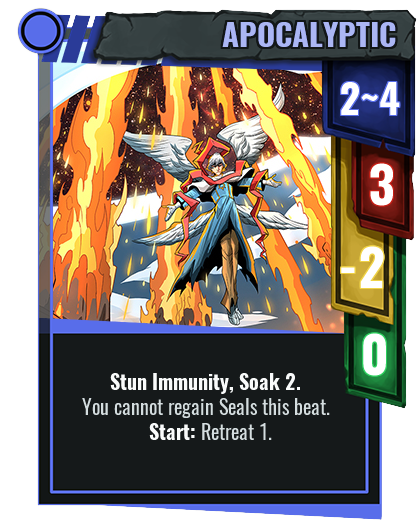 Unlike his other styles, Immutable requires 2 Seal Tokens to function optimally as you have to spend one to apply the style, then spend another to get that Soak. 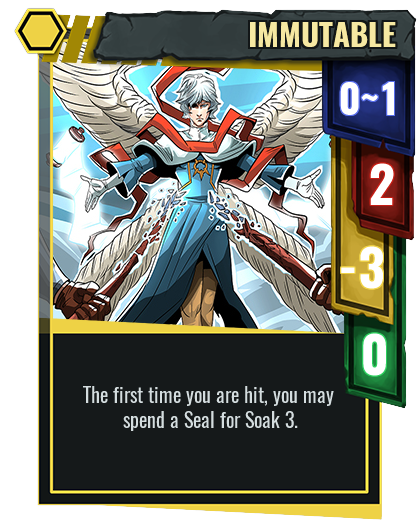 Finally, Soak, strangely, is counter-productive to Mikhail's strategy as he must take damage in order to regain his Seals. Speaking of cards that are awfully similar to Cadenza's, Transcendent essentially turns anything Mikhail plays into Cadenza's Press. What makes this immensely better than Press is the fact that it can be paired with nearly ANY base. This is due to two big factors: Range and Stun Guard. Transcendent has magical Range +0~2, meaning that it is effective at nearly any range while also enabling low-range bases like Grasp and Strike. It also has built-in Stun Guard 5 (way beyond the magical value of Stun Guard 3). This makes Transcendent quit versatile and powerful as it nearly always allows Mikhails to trade positively against any attack. This attack does have one glaring weakness: it might be too fast. Given that Mikhail must take damage in order to gain the bonus Power, he must, therefore, be the slower character. As such, be careful when pairing this with Grasp or Drive. Apocalyptic has a very fitting name, seeing as its stats are absurdly strong. If it feels awfully familiar, do not fret! It is, in reality, very similar to Immutable! The key different between them is Apocalyptic's fast movement and its Range. 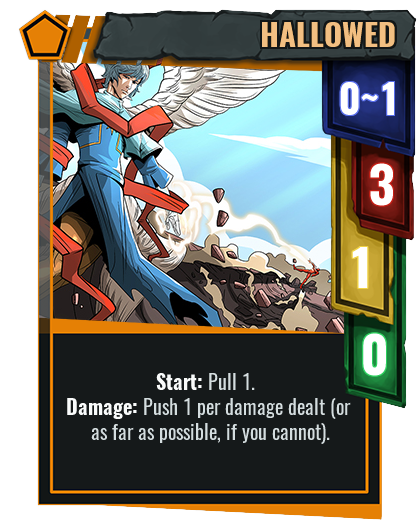 Apocalyptic gives Mikhail the ability to slightly dodge attacks at range 2 while also setting-up and dealing a considerable amount of damage to the opponent. Did I mention that it ALSO has Soak and Stun Immunity on top? This attack will barely lose any trades. One simply just has to watch out for opponents with advancing effects that can easily put them in the attack's minimum range. However, to offset this style's incredible power, it prevents Mikhail from regaining Seals on the beat he uses it. Though, it is still effectively cheaper to use than Immutable! Mikhail's Unique Base, Scroll, is an odd card because, unlike many of his cards, it has poor stats. With only 2 Power and Priority, Scroll will not be trading-up against many things. Its biggest use comes in its ability to guarantee a Token regain, regardless of what happens. This can be very good in ensuring that Mikhail is able to continue his assault over the next few beats. Specifically, Scroll is a very good counter-play to opponents who are a little too Dodge-happy. Mikhail's always had access to a "blank" style thanks to his Unique Ability, meaning that the addition of Switch does not actually benefit him much. If anything, the biggest thing is that Mikhail is now able to hold 4 styles in his hand. Seeing as his styles are absurdly good and exert a sizeable amount of pressure, having 4 can quickly force opponents to crumble. The 4th Seal is Mikhail's "no more resources" Finisher as it only hits when he has no Seals left. Seeing as a Mikhail without any Seals is completely powerless, this can serve as a great trump card to finish-off a cocky opponent. Its Range, Power, and Priority are all above average, making it a decent late-game execute as long as the opponent's Burst is down. Just remember that, unlike Mikhail's other attacks, this one is dreadfully "honest", meaning that it has little to no trickery. The only trick it seems to have is that Mikhail can sneakily play this Finisher even if he has one Seal. He simply has to ante it during the ante phase. Mikhail is most comfortable in mid to long range, making Magnus Malleus the go-to when keeping your distance. As a plus, it also scales in power depending on how many Seals Mikhail has left. This means that it can possibly deal over 10 damage! Its above average speed and intense power allow Mikhail to threaten people with a swift death so long as he has the Seals to back it up. One thing to remember is that, unlike Mikhail's attack pairs, he doesn't need to ante a Seal to make this attack work. Instead, he can choose to spend Seals once the attack has already hit, making this safer in terms of Seal expenditure. Older PostBattleCON Online v0.13 is here!